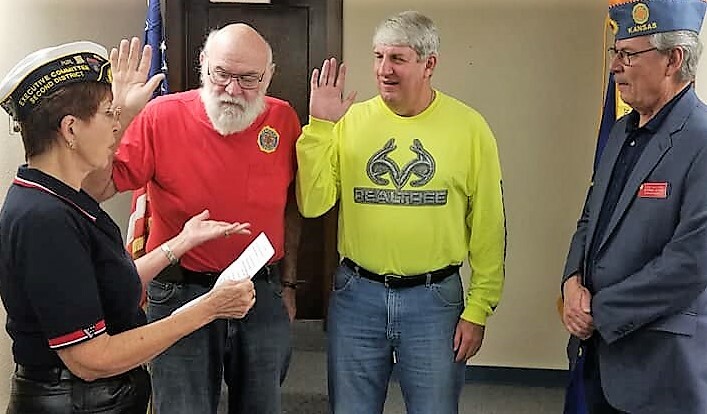 Installation of SAL Squadron Officers Commander Jeff Norris and Adjutant Carl Jowers by 2nd District Executive Committeewoman Myra Jowers, with SAL Department Adjutant Don Culver observing. Sons of the American Legion Squadron 25 was chartered Saturday, October 20 with 10 members. Squadron Commander is Jeff Norris. Adjutant is Carl Jowers. SAL members are invited to attend the Post 25 general membership meetings. SAL members are not allowed to vote on Legion issues. October 23. Tuesday. American Legion Post 25 Commander Carl Jowers has office hours at Memorial Hall from 9 – 11 am. Carl is available to discuss any suggestions or concerns you may have about Post 25, Veterans issues in general or just to help solve world problems. Carl will meet with you at other times by emailing him at carljowers@yahoo.com or calling him at 904.553.1848 to schedule an appointment. October 23. Tuesday. American Legion Service Officer Myra Jowers is at Memorial Hall from 9 – 11 am. Myra is available to assist you with questions about your VA claims or paperwork. This free service is for ANY Veteran or family member who may have questions about starting a VA claim or have questions about next steps. Please share this information with any Veteran you may know who might need assistance in dealing with their VA paperwork. October 25. Post 25 Color Guard meets in Memorial Hall at 7 pm. 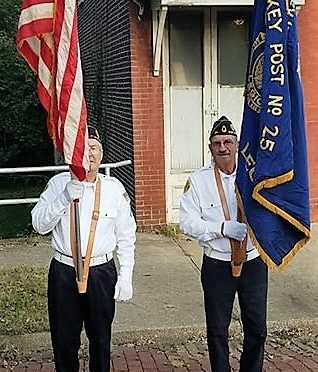 The Post 25 Color Guard is open to all Post 25 members. October 27th. 2nd District Commander Homecoming in Blue Mound. All Post 25 Legionnaires are invited to attend. October 30. Tuesday. American Legion Post 25 Commander Carl Jowers has office hours at Memorial Hall from 9 – 11 am. Carl is available to discuss any suggestions or concerns you may have about Post 25, Veterans issues in general or just to help solve world problems. Carl will meet with you at other times by emailing him at carljowers@yahoo.com or calling him at 904.553.1848 to schedule an appointment. October 30. Tuesday. American Legion Service Officer Myra Jowers is at Memorial Hall from 9 – 11 am. Myra is available to assist you with questions about your VA claims or paperwork. This free service is for ANY Veteran or family member who may have questions about starting a VA claim or have questions about next steps. Please share this information with any Veteran you may know who might need assistance in dealing with their VA paperwork. November 2. Post 25 general membership meet and greet. Light refreshments will be available. Starts at 6:30 pm. November 5. Post 25 general membership meeting. Starts at 7 pm. The meeting is held at the Memorial Hall at National and 3rd in downtown Fort Scott. All Post 25 members, eligible Veterans and guests are invited to attend the meeting. Light refreshments will be available at the end of the meeting. November 9 – 11. Veterans weekend in Fort Scott. November 9. Friday evening, 5pm: Reception @ Boiler Room Brewhaus, 2 S. National Ave.
November 9. Saturday, 10am: Veterans Day Program @ Memorial Hall, 1 E. 3rd St.
November 10. Saturday, 12 – 4 PM. “A Gathering of Veterans” at VFW Post 1165 for fellowship and camaraderie. November 10. Saturday, 5 pm: Veterans Day Parade in Downtown Fort Scott. All Veterans are encouraged to participate. Transportation will be available for those unable to walk in the parade. November 10. 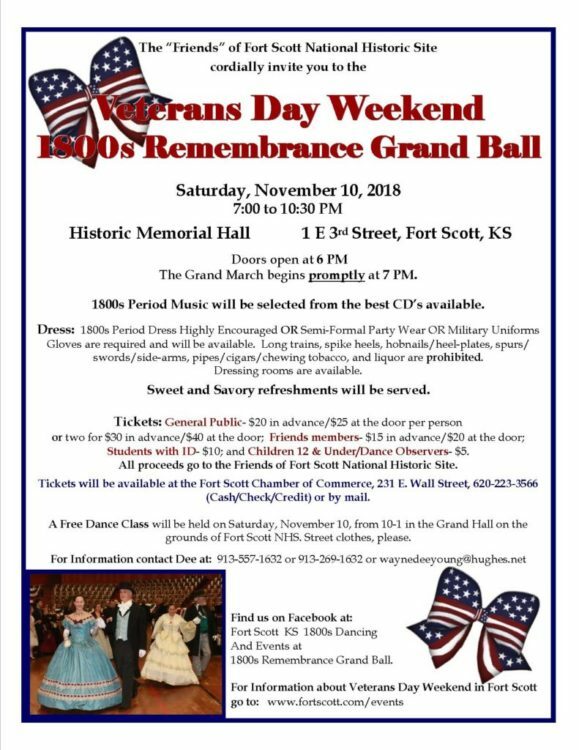 Saturday, 7pm: 1800’s Grand Ball @ Memorial Hall, 1 E. 3rd St.
November 11. Sunday, 11am: Veterans Day Service @ US National Cemetery No. 1, 900 E. National Ave.
November 11. 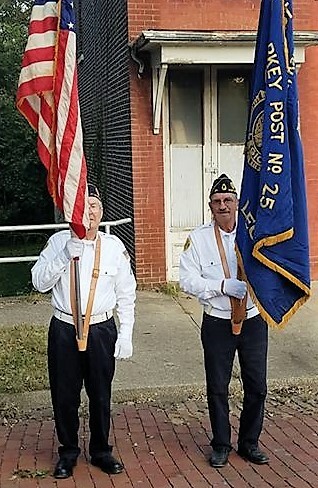 Sunday, 12pm: Lunch @ VFW, 1745 S. National Ave.
Post members Darrell Spencer and Marvin Taylor prepared to carry the colors at the recent Fort Scott Pioneer Harvest Parade.